Census Maps - U.S. census statistics and maps. Cityscenes - Satellite images of major US cities. Desert Maps - DesertUSA - Extensive index of maps appearing in the DesertUSA Web site. EPA Maps On Demand - A service provided by the U.S. Environmental Protection Agency for displaying environmental information for the entire United States. Earthshots: Satellite Images of Environmental Changes - Earthshots is a collection of Landsat images and text, designed to show environmental changes and to introduce remote sensing. Freetrip.com - Highway trip planner that creates personalized driving itineraries, including hotel bookings. Geospatial Data Clearinghouse - Search across 80 different spatial data servers. Interactive Maps: United States - Map Stats (Census Bureau), TIGER Mapping Service (Census Bureau), National Atlas of the US, Enviromapper, Maps on Demand -- from the EPA's Envirofacts warehouse. Map Academy - Topo Map Software featuring USGS Topographical Maps on CD ROM. 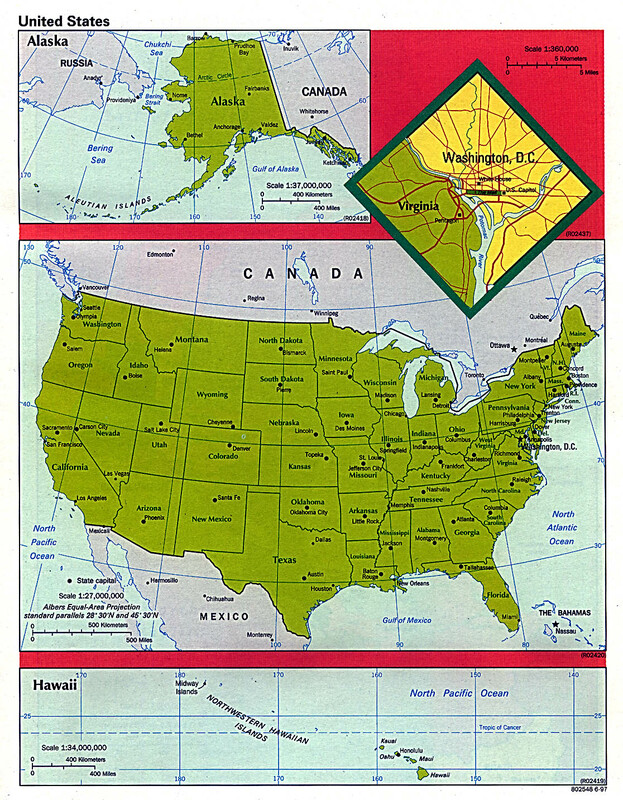 Map Collections Home Page - A searchable collection of maps from the Library of Congress. Map Software - Terrain Navigator (formerly TopoScout), USGS topographic maps of most states on CDROM. Map of the United States - 1116 x 1432 pixels - Very Large. Maps of the USA - Maps of all 50 United States, with flag GIFs.